The Shiny Seventh was an ordinary Kitchener battalion, a body of men raised for the duration of the war, forming part of an ordinary county regiment. They saw extraordinary things and performed extraordinary actions as part of 18th (Eastern) Division, one of the most consistently successful British divisions on the Western Front. 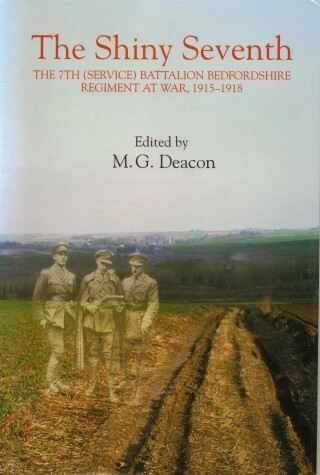 This is their story as told by their successive adjutants in the official War Diary. It tells of the drudgery of the trenches, fatigues, entertainment and endless training, including that of the newly arrived Americans in 1918. It also chronicles a rare success on the First Day of the Battle of the Somme, confusion at Arras, dash and gallantry at Ypres, endurance during the great retreat of March 1918 and a final ‘backs to the wall’ fight in front of Amiens which was instrumental in safeguarding the position of the entire British army in France, and thus the outcome of the war itself. The personal diary of one of its subalterns, Henry Cartwright, is included as an appendix, courtesy of his great nephew, along with descriptions of the battlefields today and details of places visited and casualties suffered by this extraordinary, ordinary battalion. Martin Deacon is an archivist at Bedfordshire Archives and Records Service.